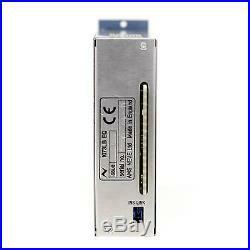 Provides aNeve 1073 EQ circuit in a single 500-series module. The 1073 is widely considered the worlds premier mic preamp & EQ module, delivering the unique Neve sound featured on some of the most famous recordings of the past 40 years. The big, punchy sound of the classic Neve 1073 module complements any musical genre, from rock to rap, jazz to classical. Its lush sound with classic Neve signature makes it the consummate mic-pre/EQ module for recording vocals, guitars, and acoustic instruments of all descriptions. With the 1073LBEQ module, the highly sought-after classic EQ sound is now available in a 500-series form-factor. When integrated with 1073LB preamp, the combination is 100% discrete and = genuine 1073 mic pre/EQ. Rotary controls provide accurate adjustment of the 1073 3-band EQ and High Pass Filter. Signal presence LED illuminates green from a level of -25dB and red from a level of +24dB. Switch for EQ IN/OUT function, with LED indication. 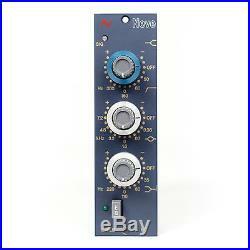 Electronically balanced classic Neve circuits used in Line Input and Line Output stages for standalone module use. These stages are bypassed and the 1073LBEQ module is 100% discrete when combined with the1073LB mic preamp. Audio Processing Insert design allows the audio to/from the1073LBEQ module to be inserted into the audio path of an existing 1073LB (modules must be fitted in the same rack). High frequency concentric knobs perform two functions: HF shelf control and High Pass Filter control. Fully screened module packaged in Mu-metal case eliminates stray electromagnetic fields from Lunchbox PSU or other module types. The 1073LBEQ provides the legendary sound of Neve in a remarkably simple format. A Line level input feeds an electronically balanced EQ circuit with 3-bands of adjustable EQ and a High Pass filter, which can easily be switched in/out. The output is also an electronically balanced Line level output. A signal presence LED and Neves clever Audio Processing Insert design is also integrated into the module. 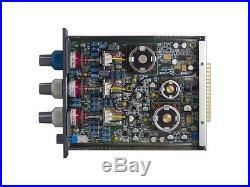 The 1073LBEQ can be modified to work as an inserted process with an existing 1073LB mic pre module. A modification is required inside both units and a cable, which is supplied with the 1073LBEQ module, is needed to connect the LB mic pre to the LB EQ. The result of this is a. Genuine 1073 mic/pre input -> EQ ->. Output audio path when in this mode. This mono unit is the perfect solution for studios and audio engineers looking to bring in the very essence of the Neve 1073 EQ sound to their portable racks. Work with the A Designs 500HR 2 Slot rack or the Empirical Labs EL500 2 Slot 500 Series Rack. The item "Neve 1073LBEQ (Open Box)" is in sale since Saturday, August 13, 2016. This item is in the category "Musical Instruments & Gear\Pro Audio Equipment\Signal Processors/Rack Effects". The seller is "thegearbaazar" and is located in Miami, Florida. This item can be shipped to United States.